On the 19th September various teams from local properties got together at High Close for a day of team building. As well as spending a morning helping speed along one of several footpath improvements the day was a chance to share ideas amongst colleagues, discuss projects and learn about each other's properties so that we can share this knowledge with our visitors. The house and gardens at High Close date back to the mid-1800's when they were purchased by Edward Balme Wheatley-Balme, a Yorkshire merchant and philanthropist, and planted up with many rare trees and shrubs from all around the globe. The estate was left to the National Trust in 1953 and the house was leased to the Youth Hostel Association shortly afterwards. 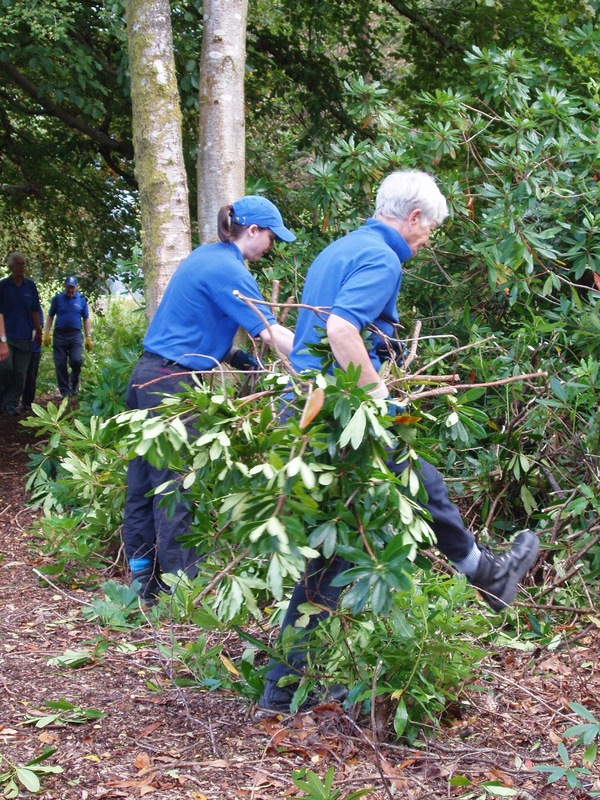 Much of the garden has been in disrepair for many years but recently a National Trust volunteer group has taken ownership of the garden and cleared back areas of rhododendron and unearthed much of the original path network. The first job was to put a wooden edging to the sides of the pathway, ready for gravel to be put in at a later date. This involved measuring out the pathway at each point, using a mattock to level the ground and then digging posts into the ground to attach the wooden rails to. Meanwhile, another team worked on invasive species control by uprooting and burning rhodedendron and cutting back the bramble to allow the area to be landscaped, in keeping with the history of the High close estate. After a lunch "talking shop" and ensuring we don't reinvent the wheel at each property the team were given the chance to bond over an archery lesson - many thanks to Millie from the YHA for being such a great teacher. It's fair to say we weren't natural archers, but we took great delight in the small progress we did make! A great day was had by all, morale was kept high and some great ideas shared. High Close estate is always open to visitors and the YHA run a small cafe - look out for a blackboard on the road entrance for opening times. There is limited parking available free of charge. Improvements to the View Point Area, and the path at Aira Force. Work was needed on the path leading down from the small National Trust car park on the Dockray Road to a view point close to Aira Force. The viewpoint area itself was due to be resurfaced. The small wooden bridge that crossed the beck was old. For safety reasons it was removed and a concrete pipe was put there in its place. Kevin Tyson was contracted to do the excavating, and to fill the power barrows from the aggregate pile dumped at the car park...the nearest practical point. The power barrow on its way from the car park to the site down the steep narrow path. about the next stage of the work. Kevin was to level out part of the area prior to it being entirely resurfaced. It was a tricky job as Kevin had to reach over the railings with the excavator arm. A lot of concentration needed! Digging out the turf which the digger couldn't reach. Power barrow coming into its own, yet again, to take the turf away in order to landscape the area around the newly installed pipe. Resurfacing inside the viewing area. A "wacker plate" was used to firm up and compress the new surface. The new surface. Within a short time, it will weather to match the path surfaces elsewhere at Aira Force. The path above the newly installed pipe. The view, taking in Place Fell, St Sunday Crag and Glenamara Park. (Ancient Wood Pasture) See post ...Glenamara Park... on this Blog Site. Phytophora Ramorum is a fungus like pathogen that causes immense damage and death to many tree species. In the United States different strains of P. Ramorum have decimated native oak populations. The strains found in the UK have had negligible impact on our oaks, but have infected many Japanese Larch tree plantations here. Evidence has shown that Rhododendron acts as a host for P. Ramorum; the pathogen produces spores that are easily wind blown thus causing new infections. P. Ramorum has been found in Rhododendrons at a site on the A592 near St. Catherine's, National Trust. To reduce the risk of the pathogen spreading all the Rhododendrons at St. Catherine's are due to be cut down. The work started on Sunday 7th of September with tremendous help from the Cumbria National Trust Volunteers! Cutting back and burning the Rhododendron Ponticum. Pruning and clearing the outer branches to allow access for cutting the main stems with either bushman or chain saw. 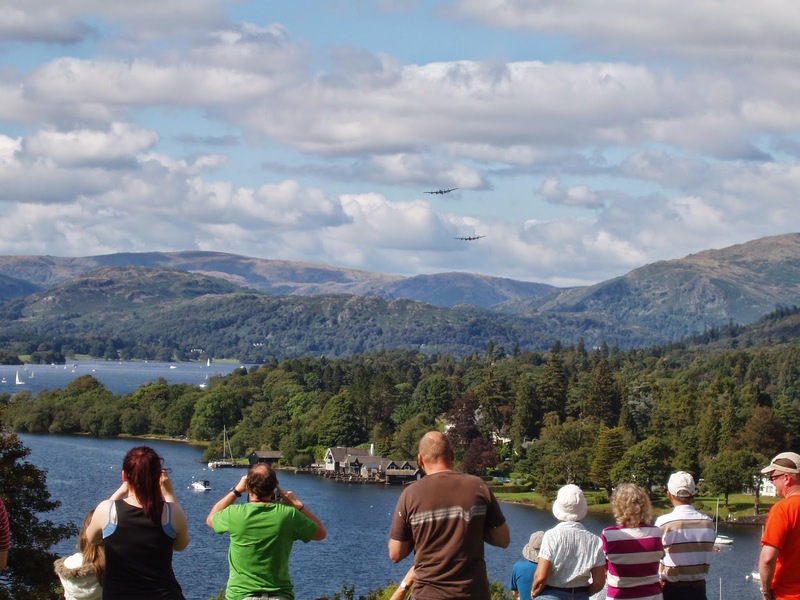 Time out was taken to watch 2 Lancaster bombers fly over Windermere from the vantage point of Adelaide Hill. Wonderful weather and a good turn out on this very special occasion. Himalayan Balsam "Pull For A Brew" with South Cumbria Rivers Trust. The last organised volunteer balsam pull for this year with South Cumbria Rivers Trust took place at a site near Skelwith Bridge on Saturday 30th August. Vanda and I met up with Jen at 10 am. Sadly, no one else turned up; after waiting a while, our small band set to work. and shades out our native plants, reducing diversity, and denuding river banks of understory vegetation. Winter die back exposes the bare soil to erosion. A volunteer, working on a recent National Trust project, told me about several studies that indicated volunteering has surprising benefits for the volunteer. She summed it up: "Doing good for the community makes you feel good...and does you good!" Because it was so late in the season, bin bags were used to contain the ripe seed pods; they would be incinerated later. Many of the pods could be heard popping inside the bag! Cutting the stem with the seed pods ready to put in a bin bag. A single plant can produce 800 seeds and project the seeds up to 4 metres away; hence the plant can spread with phenomenal speed over a few seasons. An awkward site. I am in a silted up drainage ditch. It is easy to see why the Victorians were so taken with this plant. Bees find Himalayan Balsam irresistible because it contains so much nectar. become dominant over large areas very rapidly. Bees are drawn to this invasive species. Note proboscis already extended! Oh Yes, this is 'THE PULL FOR A BREW'. Chesters By The River, a bakery, café, and shop, heard that a balsam pull was to take place nearby and had kindly offered in advance to treat all participants to a cream tea. Thanks to all at Chesters.